A Question of Form Factor? 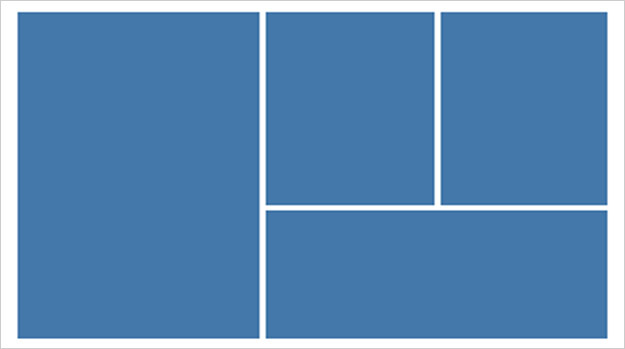 Responsive design is a pre-requisite for all analytics and data visualization solutions. A couple of months ago I managed to break the screen on my iPad Mini, which for the record coincidentally happened to be a week after Apple released its most recent range of iPads and only a couple of weeks after the new iPhone 6 and 6Plus were released. Nevertheless this presented me with a quandary; should I replace with a new Mini or go for the larger iPad Air 2? It was, put simply: a question of form factor. To help me make up my mind I created a simple survey, posted it on Twitter and just under 80 people responded. I asked 3 questions: what size iPhone do you prefer, which size iPad do you prefer and which combination of iPhone and iPad do you prefer? Firstly the results presented below in Qlik Sense Desktop show that the iPhone 6 seems to be the most popular with 43.4% preferring it, in close second place was the iPhone 4/5 with 42.1% and finally the iPhone 6Plus came in last with just 14.5% of the vote. 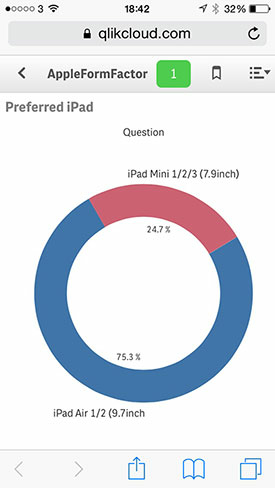 The choice of iPad seems pretty decisive with 75.3% preferring the larger form factor of the iPad Air with only 24.7% preferring the Mini as the Qlik Sense Cloud chart from my iPhone shows below. 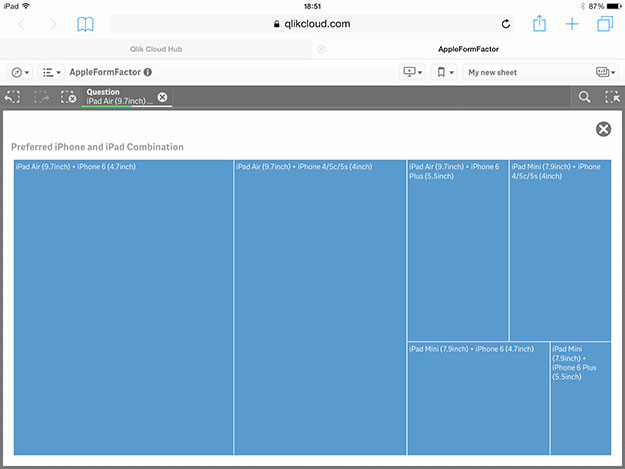 Finally and thankfully consistent with the individual choices, the preferred combination with 36.8% was the iPhone 6 and the iPad Air, shown below on my iPad, also in Qlik Cloud. In the context of analytics, it’s no longer enough to work on all devices; it needs to do so without any redesign required. Well firstly thanks to the insight from my Twitter followers I’ve bought the iPad Air and the iPhone 6 and they are working out just fine. However in thinking about this more another thought occurred to me, just looking at Apple devices I had a choice of 6 combinations (12 if you consider landscape or portrait options) but if I start to think about other devices the combinations grow exponentially. Combine this with the fact that the number of mobile devices that are actually in use this year is expected to surpass the number of people on earth (7.7 billion mobile phones and tablets compared to 7.1 billion people) then it has become essential that the principles of responsive design are now a pre-requisite for almost all software applications. In the context of analytics, it’s no longer just good enough to work on mobile devices, but analytics must work on all devices without any redesign required. Furthermore, the paradigm has shifted from just consuming analytics on the device, you also have to be able to create and interact with the analytic wherever you are and on whatever device you happen to be using. These are principles that are built into Qlik Sense and Qlik Cloud as my albeit simple analysis of Apple form factor above shows. 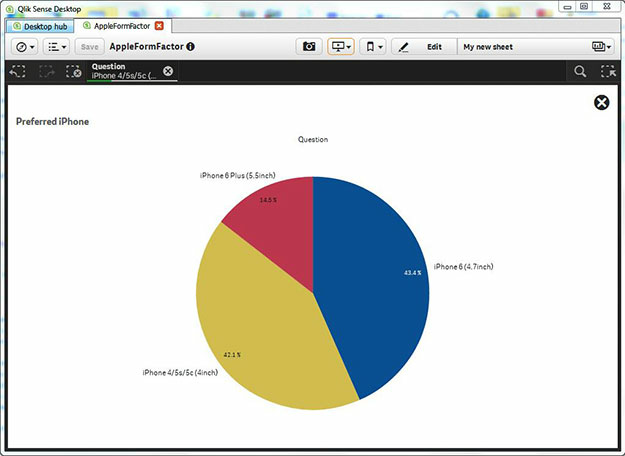 I simply downloaded the raw survey data, loaded it into Qlik Sense Desktop, created my visualizations and then shared them in Qlik Cloud so I could continue the analysis on my iPhone and iPad. If you are interested in learning more about responsive design and how you can go mobile with Qlik Sense check out our short video. Finally, thanks to all who completed the survey. The only question that remains is whether or not the preferred form factor combinations will change when Apple releases the Apple Watch later in the spring. Let me know what you think.